Workers during an industrial action. While in Dubai, some officials posted on their facebook, their social outings and shopping for exotic cars. A source familiar with the NLC said the theme of the retreat was not known, nor is the source of the money used to fund the Dubai trip. “This is a pattern that has become so worrisome,” the source said. 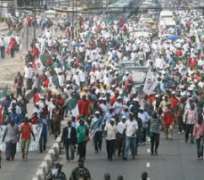 Vanguard learnt that last year, the NLC paid into the account of its officials N3,000,000 (Three million Naira) each. “The money was nothing short of a bribe. That cannot be their salaries and we don't pay part time officials salaries,” said our source. Our source said, only one member of NAC queried the source and dissatisfied with the explanation of the hierarchy of the NLC, he returned the money. All others accepted the money which was paid into their bank accounts. Another source close to the leadership of the NLC said, “Your guess is as good as mine. Election is around the corner and this could be a away of taking labour in. There is also the issue of NASU which the president without consultation, barred NASU from returning to the Congress. So, this trip could also be about buying these union leaders to support the decision”. NASU, an affiliate of the NLC withdrew from the activities of the Congress about three years ago following a dispute over the process that led to re-election of Abdulwaheed Omar as NLC president. Efforts made to reach the NLC president, Comrade Abdulwaheed Omar and the Acting general secretary, Chris Uyot at the time of filing this report were unsuccessful. Contacted for comments on the retreat and the allegation of NLC officials spending money from unnamed sources, the pioneer president of the NLC and former executive secretary of the Organisation of Trade Union Unity (OATUU), Comrade Hassan Sunmonu, who spoke to Vanguard on phone from Oshogbo, Osun State, said of the retreat “It does not appear to me opportune for them to have left the country at this critical moment”. He said, there were important issues, such as the National Conference, the alleged missing 10 billion, the crisis between the presidency and the Central Bank which culminated in the sack of the then Central Bank Governor, Sanusi Lamido Sanusi to which the NLC's voice should have been heard. The former NLC president said, “I will like to have a more convincing reason for the retreat from them”. Another former officer of the NLC who prefers anonymity said, “When Oshiomhole led the NLC, we were at the NLC to protest against N5m furniture allowance for legislators. Now, billions of Naira is reportedly missing and the NLC's voice is not heard. What does that tell you?” he asked. Comrade Sunmonu said “ I don't know why they went to Dubai. There are places within Nigeria where they can have such retreat. There are facilities owned by government and the private sector that could have been used. He however, insisted “I don't have their side of the story”. On the allegation that the source of the funds is shrouded in secrecy, the former NLC president said “If it is not from NLC purse, where is it from and for what purpose is it being provided for the leadership of NLC. There is no free lunch anywhere”. Those who were in Dubai for the retreat include; Deputy presidents, Kiri Mohammed, Promise Adewusi and Joe Ajaero. Also on the trip were Vice presidents, Issa Aremu, Emmanuel Ajoku, Lucy Offiong and Anthony Nted. Other elected officials were Trustee, Comrade Igwe Achese, Financial Secretary, Boniface Isok, Ex- office , Sarah Gana and Papa Kunini , Ex-Officio.